Of all the proteins in human mitochondria, only 13 cannot be produced from nuclear genes outside the mitochondrion and are instead produced from mitochondrial genes. Breakdown of the mitochondrial DNA may be one of the fundamental causes of aging. SENS suggests that we could address this problem if the remaining 13 proteins could be built from genes in cell nuclei and imported into mitochondria like the majority of mitochondrial proteins. This claim will be judged true if peer-reviewed papers, all published by the end of 2012, demonstrate that mammalian nuclear DNA can be modified to build each of the 13 proteins (not necessarily, at this time, all in the same cell at the same time) such that they are transported into the mitochondrion and perform their normal function. When the proteins have been successfully transported, the cells will be able to grow in medium in which the glucose has been replaced by galactose. Aubrey de Grey has proposed SENS, an ambitious project to extend human life span. Technology Review attacked his science in a cover article in 2005, and appointed a panel of judges to determine if anyone would be able to present a conclusive argument that de Grey's work was "unworthy of learned debate." No one won the challenge, but this claim is based on a prediction that de Grey made that one of the submissions challenged. de Grey publicly bet (search for "confident") in 2000 that this would be known technology by the year 2005, but the article that he thought would be published imminently in Science didn't appear until 2005 in Rejuvenation Research (de Grey is editor-in-chief). de Grey explained the background of the bet and his expectations on a mailing list (subscription required in order to review archives). The claim owner's blogging about the Tech Review Challenge and its results here and here . 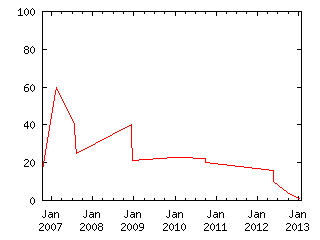 Aubrey de Grey assisted with the wording, and agreed that 2012 was a reasonable target. The claims MMPost, MMrev, and MMPst1 are related.